Just a note to say a big thank you for playing the most perfect music and songs for our special day. The beautiful music that you played will be forever in our memories. Just a little note to say a big thank you for playing at our wedding. The music was beautiful and created a fantastic atmosphere, especially during the ceremony. Thanks again. Thank you for helping to make our wedding at Himley Hall so special. So many people have commented on both your professionalism and perhaps more importantly -- your fabulous playing! We hope to see you at a future wedding we recommend you for in the future. Many thanks. Very special thanks to you for the wonderful music at Natalie and Stephen's wedding service. Appreciation has been expressed by everyone present. It was a perfect day. Thank you, thank you, thank you. As you can tell, we are over the moon that you could join us and share your musical talents with us on our special day. Our entire wedding party loved your music and your rendition of "I've Dreamed of you" will be an everlasting memory of our wedding ceremony. We could not have imagined how many smiles you brought to people's faces, not to mention the odd emotional tear, too! Our day at The Blakelands was amazing and we were immensely happy that you were such an important and memorable part of our wedding day. 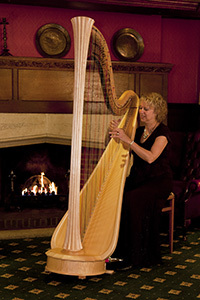 Just a note to say thank you for playing and singing so beautifully at our wedding ceremony at the Hilton, Bromsgrove. We had a wonderful day and I was still calm enough to take in your playing and singing and appreciate it. You played a great part in making our day complete.